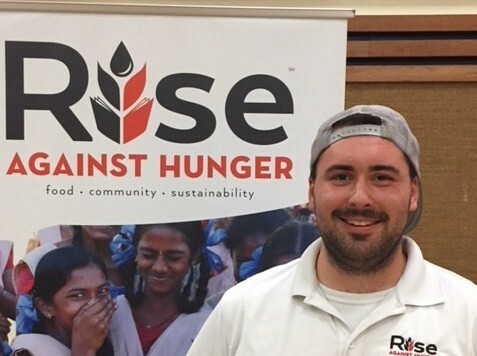 Biographic Snapshot: Alex Hart is a Program Manager, National Capital for Rise Against Hunger, an organization that works to alleviate hunger in the USA during climate crises and overseas. Alex was involved in a recent volunteer event in McLean, Virginia to assemble food/soup packages. WHES: How did you (personally) get interested in hunger and hunger issues? Alex: When I was younger, I was a Boy Scout and Eagle Scout, and there were badges one could earn which involved hunger also, we did “Scouting for food’ collections. As a child I volunteered at a Baltimore soup kitchen for many years. My parents showed us that having enough food to eat was not the situation for everyone. They were instrumental in developing this concern for others. Since both my parents work for non-profits, this was a natural response. I feel my interest in helping others, especially addressing hunger, arose from my younger life experiences. WHES: What was your first official work on hunger? Alex: Right after finishing my undergraduate degree at Kent State University I saw this position was open in the DC Metro area. It looked attractive to me. Given my history, the position immediately sparked my interest and I’ve been working at Rise Against Hunger ever since (two years). WHES: What drew you to work with RISE? Alex: This was an organization that looked like it was making a difference in peoples’ lives. It is the perfect job for me; it is hands on, one goes out in the community and helps educate people about the issue of hunger and about the work of Rise Against Hunger. It’s not a desk job! WHES: Can you explain how Rise Against Hunger works? Where does Rise work? Alex: Rise Against Hunger (formerly called Stop Hunger Now) was founded in 1998 with the vision of ending hunger in our lifetime. Our Meal Packaging Events provide a fun hands on way for volunteers to make an impact. Over the years we have provided over 362 million highly nutritious meals to impact partners in 74 different countries. Rise Against Hunger has 20 US locations and 5 international offices that facilitate the process of creating a meal from start to finish. We do everything from engaging and educating the community, fundraising, coordinating events and providing the space (if needed) to package our meals. Volunteers fill bags with measured amounts of soy flour, a dehydrogenated veggie blend, and a vitamin and mineral mix. RISE also will help sponsor corporate events and schools, houses of faith, among other groups. During a meal-packaging event, we have a lot of fun. The idea is you can do something about hunger and it can be fun. WHES: Who are some of your implementing partners? Alex: Our primary partner is the volunteer. Those who come to prepare the package, get more informed about hunger issues, and want to do something. Over 70% of our meals go to youth in the countries we serve through school feeding programs. These programs provide children with the ‘want’ to go to school and the confidence in parents that their child will get at least one meal that day. We also respond to emergencies. For example, during the Atlantic hurricanes in Houston and Florida in the US, we provided food as well as in the Caribbean islands hit by massive mudslides. We had meals on hand where they are needed. Lastly we foster empowering communities to do income-generating activities and try to impart a lasting legacy so they could be able produce their own food. We work with international non-governmental organizations to provide the meals, education and income generating activities overseas. WHES: Do you have a success story to share with our readers? Alex: I love when Rise Against Hunger works with young people! It’s amazing to see the change in young folk when we tell them about students in other parts of the world who do not have the privilege of eating a meal each day and go to bed hungry. Children start to see the bigger picture and are usually very interested in learning how they can help. Recently I was in Nicaragua and saw first hand that the children were receiving the food and seeing that impact provided me the ability to bring our organization and what we do full circle. My hope is that the students act on that what ever they are passionate about and go with it, especially if it is something that can help others. WHES: Are there volunteer opportunities in the US or overseas? Alex:Yes – there are! That is the bread and butter part of Rise Against Hunger’s work. There are events that come up during the year. Go to our website and type in your location and see where the nearest one is to you. Staff will give advice and help people walk through the steps. Rise can help others learn to do the fund-raising. Alex:I have three pieces of advice. 1. BE LOUD! There are so many opportunities via social media and internet to get messages across. Hunger is a big problem. Tweet about it, use Instagram, write your Senator. 2. Get involved. Whatever your passion is, lend a little of your time to the issues that are important to you. Even giving 2 hours a year is good. 3. Do your research- read about more things, look up things, and educate yourself.